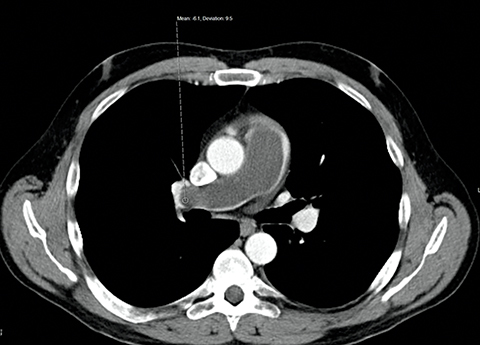 A 46-year-old man with a history of liposarcoma presented to the radiology department for an outpatient contrast-enhanced chest CT after reporting to the primary care provider that he had become increasingly short of breath over the past several weeks. Over the past five days he had become acutely more dyspneic. He reported difficulty with daily activities, such as walking and exercising. He denied any changes in symptoms with position or environment. He denied any chest pain, weight gain or swelling, cough, hemoptysis, or dizziness. His review of systems was otherwise negative. He denied any alcohol, tobacco, or illicit drug use. His most recent physical exam performed by his family physician the day prior to presentation was notable for a clear lung exam, a regular cardiac rhythm, and lack of swelling or neurologic dysfunction in the extremities. His complete blood count, basic metabolic panel, and a sedimentation rate were normal. He had an EKG performed, which showed normal sinus rhythm with S waves in lead 1 and T-wave inversions in leads III and precordial leads. He also had a lower extremity duplex ultrasound, which was negative for thrombus. His history was significant for liposarcoma diagnosed in the left calf 16 years prior to presentation. This lesion was excised with clear margins at the time of surgery. He underwent local radiation. Nine years later, he had a recurrence in the right thigh and the right superior pubic ramus. The lesion within the right thigh was resected with clear margins. The lesion within the superior pubic ramus showed interval increase on follow-up imaging and was treated with local radiation. The patient was started on a heparin drip and taken to the operating room for pulmonary thromboendarterectomy. Upon entering the pulmonary artery, the operating surgeon found soft tissue extending from the right ventricle and into the right pulmonary artery without evidence of clotted blood. 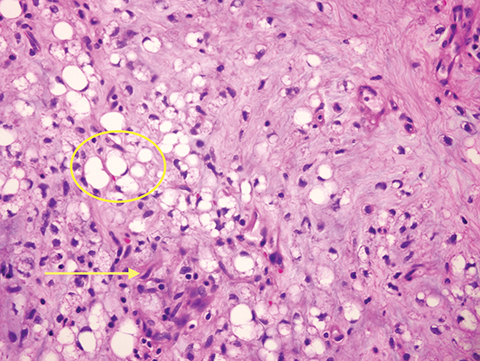 Pathology confirmed the presence of a myxoid liposarcoma (Figure 5). After a week of postoperative care in the ICU, the patient was discharged in good health. His post-discharge care included plans to pursue radiation and chemotherapy for further treatment of liposarcoma. 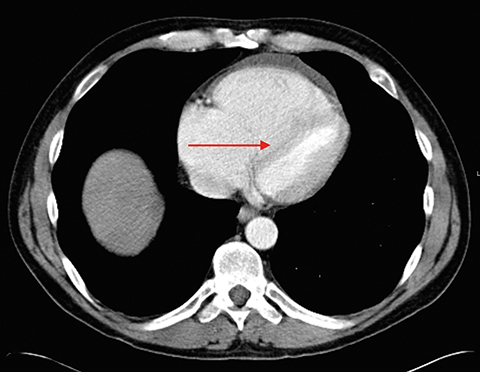 Upon presenting to the imaging center, he received a standard bolus of contrast for performance of the chest CT for concern for pulmonary embolism. 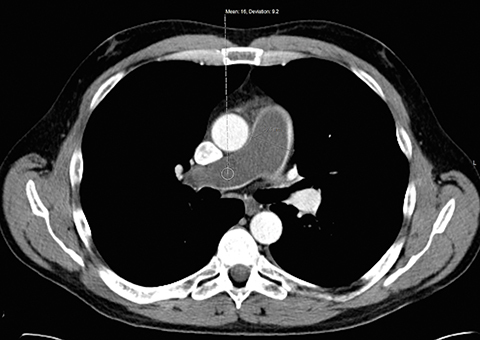 Upon completion of the CT, the radiologist saw a large hypoattenuating filling defect within the main pulmonary artery and extending into the right pulmonary artery branch. The defect appeared to extend into the pulmonary outflow tract in the right ventricle (Figures 1-3). The pulmonary artery was dilated and measured 4.2 cm compared to the adjacent ascending aorta, which measured 3.8 cm. The filling defect measured in the range of -6 to 16 Hounsfield units, atypical for thrombus. There was flattening of the interventricular septum with enlargement of the right atrium (Figure 4). There was reflux of contrast into the hepatic veins and IVC consistent with elevated right sided cardiac filling pressures. Liposarcoma is the most common type of soft tissue sarcoma.1,2 It usually presents in the lower extremities (approximately 80%), with the medial thigh and popliteal region being the most common.3 The remaining cases present in the groin, upper extremity, or retroperitoneum.4-7 One case report describes presentation within the anterior abdominal wall.1 Liposarcoma presents in the 4th to 5th decade with painless soft tissue masses, usually measuring over 10 cm by presentation.8 Treatment of liposarcoma includes primary surgical excision with adjuvant chemoradiation. Radiation has been shown to have better outcomes than chemotherapy alone.9,10 The 5-year survival rate is roughly 44-77% depending on the histologic presentation and the presence of comorbidities and metastatic disease.11 Prognosis is worsened with age greater than 45 and the presence of spontaneous necrosis seen on imaging.7,12 To our knowledge, there has never been a report of a metastatic liposarcoma arising from the heart and presenting as a massive pulmonary embolism. 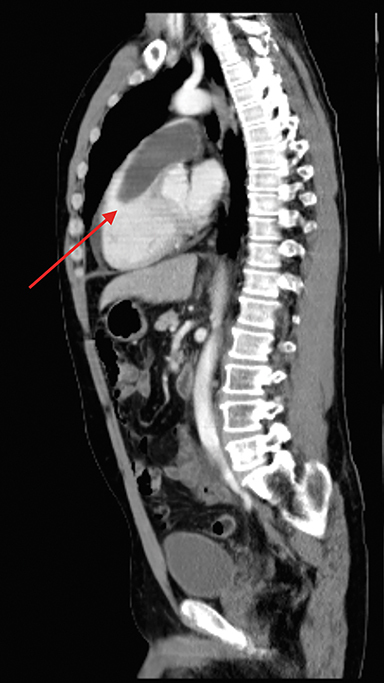 On imaging, liposarcoma presents as a heterogenous mass on CT. Attenuation of the mass typically exceeds fat but is less than that of soft tissue due to the presence of water and fat.5,17,18 In this case the mass appeared similar to a blood product and was therefore read as concerning for a large pulmonary embolism with acute right heart strain. The filling defect had a lower attenuation down to -6 Housefield units, more indicative of fat, compared to that expected for blood products of around 40-50 Hounsfield units. This finding can help differentiate a true blood clot from a soft tissue lesion. Filling defects in vessels in patients with an oncologic history could be due to blood clots or tumor thrombus. Differentiating relies on realizing the attenuation and enhancement differences between the two types of thrombus. In patients with fatty tumors, a high fat content can help distinguish these entities. Fan Z, Tian XF, Tang SX, Zhang YY, Pan JY, Wang S. Myxoid liposarcoma in the abdominal wall: A case report. Medicine. 2014;93:e239. Fletcher C. The evolving classification of soft tissue tumours: an update based on the new WHO classification. Histopathology. 2006;48(1):3-12. Arkun R, Memis A, Akalin T, Ustun EE, Sabah D, Kandiloglu G. Liposarcoma of soft tissue: MRI findings with pathologic correlation. Skeletal Radiology. 1997;26(3):167-172. Estrin JT, Ford PA, Henry DH, Stradden AP, Mason, BA. Erythropoietin permits high-dose chemotherapy with peripheral blood stem-cell transplant for a Jehovah’s Witness. Am J Hematol. 1997;55(1):51-52. Balach T, Stacy GS, Haydon RC. The clinical evaluation of soft tissue tumors. Radiologic Clinics of North America. 2011;49:1185-1196. Resnick D, Kyriakos M, Greenway G. Tumors and tumor-like lesions of bone: Imaging and pathology of specific lesions. In: Resnick D. Bone and Joint Imaging 2nd Ed. Philadelphia, PA: WB Saunders; 1996:991-1063. Murphey MD, Arcara LK, Fanburg-Smith J. Imaging of musculoskeletal liposarcoma with radiologic-pathologic correlation 1. Radiographics. 2005;25:1371-1395. Zulfiqar MI, Sheikh UN, Montgomery EA. Myxoid neoplasms. Surgical Pathology Clinics. 2011;4:843-864. Kempson R, Fletcher CD, Evans HL, Hendrickson MR, Sibley R. Washington DC: Armed Forces Institute of Pathology; 2001. Malignant lipomatous tumors. In: Atlas of tumor pathology: Tumor of the soft tissue. 217–38. Chapman T, Jour G, Hoch B, et al. Myxoid liposarcomas demonstrate a profound response to neoadjuvant radiation therapy: An MRI-based volumetric analysis and pathological correlation. International Journal of Radiation Oncology, Biology, Physics. 2014;1:S756-S757. Peterson JJ, Kransdorf MJ, Bancroft LW, O’connor MI. Malignant fatty tumors: classification, clinical course, imaging appearance and treatment. Skeletal Radiology. 2003;32:493-503. Ten Heuvel, S. Diagnostic and prognostic aspects in soft tissue sarcomas. 2014:129. Vilar JS, Martí-Bonmati L, Poyatos C, Ferrer R. General case of the day. Myxoid liposarcoma. RadioGraphics. 1991;11:333-335. Löwenthal D, Zeile M, Niederhagen M, et al. Differentiation of myxoid liposarcoma by magnetic resonance imaging: a histopathologic correlation. Acta Radiologica. 2014;55:952-960. Fritchie KJ, Goldblum JR, Tubbs RR, et al. The expanded histologic spectrum of myxoid liposarcoma with an emphasis on newly described patterns implications for diagnosis on small biopsy specimens. American Journal of Clinical Pathology. 2012;137:229-239. Evans HL. Liposarcoma A study of 55 cases with a reassessment of its classification. The American Journal of Surgical Pathology. 1979;3:507-524. Goldblum JR, Weiss SW, Folpe AL. Enzinger and Weiss’s soft tissue tumors: Expert consult: Online: Elsevier Health Sciences; 2013. Berquist T, Dalinka M, Alazraki N, et al. Soft tissue masses. American College of Radiology. ACR Appropriateness Criteria. Radiology. 2000;215:255. Berquist TH, Ehman RL, King BF, Hodgman C, Ilstrup D. Value of MR imaging in differentiating benign from malignant soft-tissue masses: study of 95 lesions. American Journal of Roentgenology. 1990;155:1251-1255. Weekes RG, Berquist TH, McLeod RA, Zimmer WD. Magnetic resonance imaging of soft-tissue tumors: comparison with computed tomography. Magnetic Resonance Imaging. 1985;3:345-352. Dooms G, Hricak H, Sollitto R, Higgins C. Lipomatous tumors and tumors with fatty component: MR imaging potential and comparison of MR and CT results. Radiology. 1985;157:479-483. Jelinek J, Kransdorf M, Shmookler B, Aboulafia A, Malawer M. Liposarcoma of the extremities: MR and CT findings in the histologic subtypes. Radiology. 1993;186:455-459. Sung M-S, Kang HS, Suh JS, et al. Myxoid liposarcoma: Appearance at MR imaging with histologic correlation 1. Radiographics. 2000;20:1007-1019. London J, Kim EE, Wallace S, Shirkhoda A, Coan J, Evans H. MR imaging of liposarcomas: correlation of MR features and histology. Journal of Computer Assisted Tomography. 1989;13:832-835. Tateishi U, Hasegawa T, Beppu Y, Kawai A, Satake M, Moriyama N. Prognostic significance of MRI findings in patients with myxoid–round cell liposarcoma. American Journal of Roentgenology. 2004;182:725-731. Rahim R, Gilkeson R, MacLennan G. Liposarcoma presenting as a pulmonary embolism with right-sided cardiac strain. Appl Radiol. 2017;46(1):42-44.